What a fantastic reading year! I managed to complete 83 books which was a record for me and beat my 2011 total of 69 books by 14! Of course, these numbers are significantly skewed due to my lack of employment in 2012, but I’ll take it! My goals for 2013 are going to be less (52 books) since I’m a working lady again, but I still hope to leave those goals in the dust. Shooting for the moon and all. On with the show! Picking my 10 favs wasn’t particularly difficult. In fact, I managed to choose exactly 10 the first time through my reading list. As with previous years, this list is classics heavy and doesn’t contain that many newer releases. I guess that’s why the classics are still hanging around all these years later, huh? Love them. Emma by Jane Austen: Is anyone surprised? Not only will this book always be a forever favorite, it’s also my favorite Austen novel. If you haven’t read it, shame on you. Ready Player One by Ernest Cline: Adored in all the ways one can adore a book. So much fun and filled with addicting adventure and the most wonderful pop culture references. A book I’ll be rereading for the rest of my life. The Art of Fielding by Chad Harbach: The characters are top notch in this debut novel and my entire book club adored this read. Lovely writing and superb development. Cold Sassy Tree by Olive Ann Burns: Now this is southern story telling at its best! The Secret Garden by Frances Hodgson Burnett: Perhaps my childhood nostalgia pushed this story over the top for me, but I adored every minute spent in that damn garden. Jane Austen: A Life by Carol Shields: I feel like anything related to Austen will always make this list, but this biography was really fantastic. I found myself grinning like a maniac many times throughout my reading. My Antonia by Willa Cather: I highlighted this book more than any other this year. Cather’s talent amazes me. The Tiger’s Wife by Tea Obreht: Such a gorgeous story told creatively. I’m amazed at how young Obreht is and can’t wait to watch her grow as a writer. 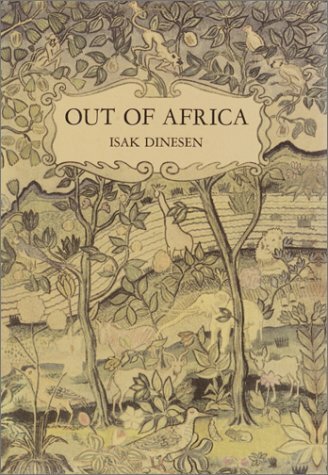 Out of Africa by Isak Dinesen: Another book club winner (at least in my own opinion!) and the imagery was the clear winner here. Africa comes alive. Cloud Atlas by David Mitchell: I haven’t seen the movie, but this novel swept me away. I found it challenging in the best of ways and utterly mind-blowing. I’m going to be lazy and not post links to my individual reviews, but you can find them all on the 2012 books read page located at the top of the blog. They are all pretty much just gush-fests. What were your favorites? Have any recommendations for me based on the above selections? How many books did you read in 2012? Let me know!! What better way to remember a beloved author than reading one of his works? I was so saddened to hear of Bradbury’s recent death because this man literally awoke the science fiction loving monster within me. As a freshman in high school I read The Martian Chronicles along with several short stories by Bradbury and have not stopped reading him since. Fahrenheit 451, Something Wicked This Way Comes, and Dandelion Wine have all been spectacular reads over the past decade and a half. So with his passing I thought I’d take it all the way back to the beginning with the very first story I ever read that he wrote – “The Veldt”. What I didn’t realize (and how could I not have realized this?) 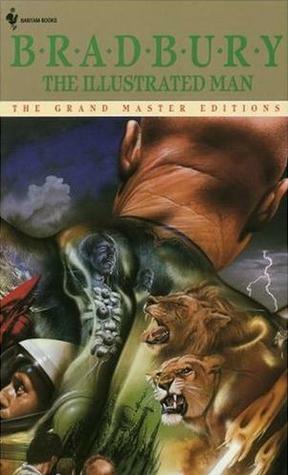 was that “The Veldt” is actually the first story in a collection entitled, The Illustrated Man. Eighteen stories are woven together seamlessly. The illustrated man is literally that – covered in beautiful lifelike tattoos that come awake at night. They bring warnings of the future and one even shows a man (or woman) his/her death. There are tales of race, gluttony, materialism, consumerism, and other bleak ‘isms’ that all involve space, many Bradbury’s beloved Mars. In one yarn, all African American people escaped Earth to colonize Mars and now, many years later, a white man is on his way to Mars for the first time – will the Martians exact revenge for the wrongs of the past or forgive this man his race’s crimes? And then there’s the previously mentioned “The Veldt” where the children’s virtual reality playroom becomes a little less virtual and a lot more reality. But perhaps my favorite of the collection (and one of the only positive, uplifting stories) tells the tale of the world’s best father. Bradbury’s writing is his amazing imagination come to life. You really almost feel like a child again as you giddily read these wondrously fashioned creations. 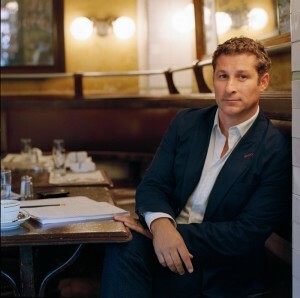 There’s just something so special about the vibrancy of his writing even when his subject matter is decidedly bleak. It’s like a painting you can’t take your eyes off of. His stories always have a message – a morale – but never feel heavy handed or indulgent. Or perhaps the magic of his writing just overshadows anything negative. I even forgive him his obvious flaw of writing terribly poor female characters. Often writers can’t get away with this, but something about Bradbury’s almost innocent style allows me to chalk his sexism up to being a product of his time (1940s/1950s). Don’t hate me for it! Clarisse from Fahrenheit 451 proves he can build a strong female! The Illustrated Man will forever remain on my shelves and has only further solidified my inner Bradbury geekdom. He’s a science fiction cultural icon and deserving of every bit of praise he receives. The world lost a truly amazing visionary this year and he will be forever missed in the literary world. I beseech all of you to pick up some Bradbury soon and discover (or rediscover) what makes his writing so effortlessly timeless. This collection is a great place to start and will appeal to anyone who likes science fiction, twisty-turning plots, a story with a moral purpose, or just fantastic, poetic prose. Reading back through what I just wrote and I sound like a complete lush gushing over her new lover. Seriously. I guess that’s how a favorite author should make you feel. Thanks again, Mr. Bradbury, for making me weak in the knees! Brand New Human Being by Emily Jeanne Miller + Giveaway! What most intrigued me about reading Brand New Human Being was the male perspective, particularly the stay-at-home dad perspective that seems incredibly almost non-existent in literature. Logan Pyle is in his thirties and a dissertation shy of his doctorate. With grad school on the back burner, he finds himself in the midst of a struggling marriage to a distant wife, father to a regressing four-year-old, and son to a recently deceased father. When he stumbles upon his wife in a precarious situation with another man, he channels his inner cray cray, grabs his son, and sets off into the sunset on a journey back to himself and ultimately, his family. Like I said earlier, the dad perspective was a welcome change of pace. Logan is a deeply flawed individual struggling to make sense out of his life and come to terms with his role as a father and his loss as a son. I thought Miller’s debut novel really excelled at showing the tough realities of family, marriage, and the crap life hands you out of nowhere. Plus, it was just nice to see a man struggling with depression and emotions because I was beginning to think they didn’t exist. 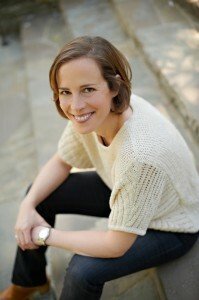 Miller impressed me with her ability to write from a male perspective believably. I wonder if male readers would agree? I also really appreciated the levity of the novel’s tone. The story really sat heavily on my conscious during my reading and gave me a lot to ponder because the situations raised and questions asked don’t have easy answers. For a while I worried that Miller would ruin the ambiguity of Logan’s problems with a storybook ending, but my fear was misplaced. The ending was left open-ended and fit perfectly within the realities of life. What didn’t impress me so much was the pacing. I kept wondering when the big event was going to happen with Julie, Logan’s wife, since this event promised to be the climatic game changer. Half way in I was beginning to have my doubts and felt the novel was floundering a bit in Logan’s self-pity, but thankfully, just as I was really getting frustrated, Miller’s plotting picked up and the second half of the novel flowed well. Character development was also hit and miss. Logan evolves beautifully, but no other character seemed to follow suit. Julie was the same terrible wife she was at the beginning and never seemed to take responsibility for her part in the shabby state of their marriage. I disliked her something fierce. I wasn’t sure if Miller meant us to think her a sympathetic character or just not super important. With a little something extra from her, Brand New Human Being would have been a near perfect debut. 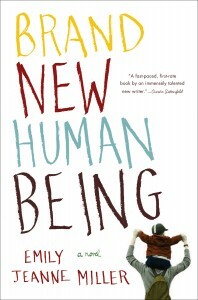 Overall, the book was enjoyable and anyone who appreciates books about the struggles of family, marriage, and mid-life identity crisis will find something wonderful in Brand New Human Being. I can see great book club discussions being born from Miller’s pages. I’d recommend it to parents as well because I suspect Logan’s hang ups – failures and successes as a father – will resonate with readers who have similar experiences. And guess what! I get to give away a copy thanks to the lovely people at Houghton Mifflin Harcourt! Just click the link below to enter. Winner will be selected on June 27, notified by email, and given 48 hours to respond! US and Canadian residents only and no P.O. boxes. Good Luck! 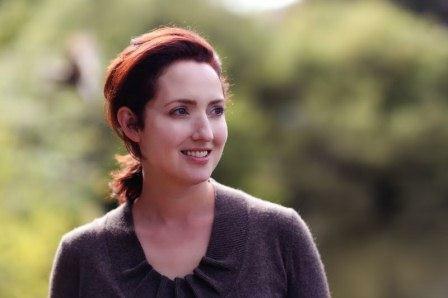 EMILY JEANNE MILLER has an MS from the environmental studies program at the University of Montana and an MFA from the University of Florida in Gainesville. She lives, writes, and teaches in Washington, D.C. Thanks to the lovely people at TLC Book Tours for a copy of the book in exchange for my honest review! Check out the other tour dates here! (Now closed!) Congrats to Allison on winning her own copy! I’ve been thinking for a couple of days about this ‘review’ and how to approach gushing about this novel while also taking the negative aspects of colonialism seriously. Normally, I wouldn’t write about a book club selection until after our meeting (which is this Sunday), but this time I really wanted to gather my thoughts before the discussion. Karen Blixen under the pen name Isak Dinesen wrote Out of Africa about her nearly two decades in Africa, specifically Kenya. She first traveled to Kenya with her husband/second cousin to operate their coffee plantation near the capital of Nairobi. During the next several years, she divorced her husband, took over the plantation’s management, entered a long-term affair with game hunter Denys Finch Hatton, struggled with illness, and, eventually, the financial loss of her farm – leaving Africa behind for her native Denmark. Within the pages of Out of Africa, you get much of her relationship and bond with Africa itself and its many peoples, but very little about her personal life – so I’d be wary to call this a memoir. A lot of criticism for Dinesen’s novel revolves around how little she’s willing to share of herself which limits the reader’s understanding of her as a person and how she relates to everything around her. There can be no character development when there is no real character discussed in any depth. Dinesen, instead, chooses to focus solely on the running of her plantation, the African natives who inhabit and work ‘her’ lands, the friends who come and go on visits, and the extraordinary landscapes and wildlife surrounding her. And she does this splendidly with the kind of prose that puts a giddy smile on my face and reminds with every page why I love reading so incredibly much. Dinesen’s imagery is the kind of writing that makes film almost obsolete. I can’t imagine a picture or movie doing her descriptions justice. After 400 pages of such layered detail, the fact that I can still envision singular images from the first 20 pages is amazing – the lion with his head covered in blood from nose to ears, the pack of elephants described as resembling a Persian rug – really beautiful stuff. And so, for me, Out of Africa becomes a sort of portal to a different world – the African bush of the early 20th century. My senses are on fire with the visceral nature of Dinesen’s writing and I completely forgive her for leaving out her personal life – there are other books for that. Think of Out of Africa as a travel log rather than a memoir. 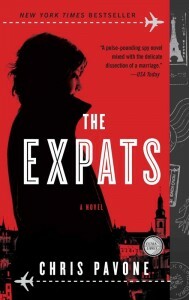 As for the colonialism aspect of the novel, yes – this book is written from the European perspective and as such will sometimes make contemporary readers squirm. Dinesen often expresses a parental condescension towards the native men, women, and children who live and work on the plantation. She also thinks thoughts and behaves in ways we could easily label as racist and ignorant. And those ideas and behaviors are wrong – we all know this (hopefully, we all know this), but her actions and the recording of them are honest and real and allow us to learn. Out of Africa lets the reader get inside the mind of a well-meaning colonist, to understand where she is coming from, to know that she means nothing malicious, but that well-intentioned racism is still racism. So, my suggestion to readers who are wary of the negativity of colonialism – supplement your reading with all the varying perspectives – those pro and against colonialism – African and European. History should be viewed from all viewpoints – not just the ones we’ve determined to be correct. I loved every moment I spent reading Out of Africa. Upon completion, I immediately googled Dinesen, Kenya, and many other regions of Africa – desperate to spend more time there. I even did some research on a Kenyan vacation and discovered that Dinesen’s house is now a museum! If only I had massive quantities of disposable income! The movie starring Meryl Streep and Robert Redford is high on my must-watch list. Anyway, if you haven’t read this book yet you are doing yourself a disservice. Go forth and read! I’ll do a quick follow up post after our book club discussion Sunday afternoon to share everyone else’s opinions. Really looking forward to this discussion! Next up, I’m currently reading Brand New Human Being by Emily Jeanne Miller for the TLC tour and hope to start My Antonia by Willa Cather this week. And I’m going to tentatively promise to finish A Clash of Kings this month as well. We shall see! So what did the group think? Very mixed bag – a very polarizing novel. Those who loved the story same as me were enchanted by the African bush, saw Dinesen as a brave explorer, and loved reveling in the luscious prose. Several members talked about how this is a book meant to be read oh-so-slowly so that you can really soak up the experience. Those ladies who weren’t a fan tended to dislike Dinesen’s voice. She wasn’t someone they cared about or wanted to get to know better. Some even thought her despicable. Most everyone loved the movie, however, no matter their feelings on the book. And pretty much everyone agreed that Africa is a must-see destination at some point in life. Meet Naomi Feinstein. She’s an uncommonly intelligent, quiet, stand-offish little girl who experiences several life-defining events as a young child. Her mother hides in her bedroom suffering from a deep depression, her father has a massive heart attack, and she loses her one true friend, Teddy, quite suddenly. 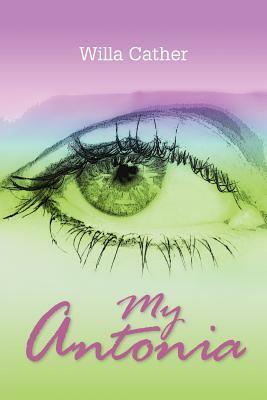 These events set her determination to become a cardiologist and save everyone in her life. Her first goal? Attend Wellesley and everything else will just fall into place. 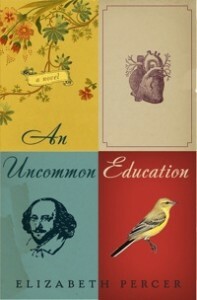 But once she joins the Shakespeare Society – things start to change. This review really has me at a loss for words. And not because I didn’t like Percer’s debut novel – I did, tremendously. Home girl can write. Honestly, her writing outshines every other aspect of the plot and characterization. Percer could write a how-to manual on ship building and I’d be all over it. I often thought that her writing talents made the story, especially character growth and development, seem weak in comparison. Does that make sense? Many readers have commented that the first half of the story were slow and a bit hard to get through. Most preferred her college years as they seemed more lively and had more action. I’m the opposite. I loved getting to know the younger Naomi and thought her development was so beautifully realized during the first third of the novel. When she finally arrives at Wellesley, I started to lose her a bit, but maybe this distance was done on purpose as Naomi’s really grappling with coming into her own personhood which differs from her girlish ideals. Once she leaves Wellesley and we learn more about her adult life, I was right back in the story – enjoying every second. The secondary characters and the entire Shakespeare Society sub-plot wasn’t fleshed out enough in my opinion. Hardly any of the other girls in Shakes were fully developed. I had a hard time keeping them straight as individuals which was always disappointing because they had so much potential. Jun was the only character besides Naomi that I ever cared about and at times I cared about her the most. I’d love to read a book about Jun and what happened to her after she moved back to Tokyo. I found her so fascinating. As for the Society, it wasn’t very exciting. They just performed plays and held meetings. I think I had it in my head that this was going to be some creepy, super-secret, dangerous society like The Skulls. Not so much. I can’t really fault Percer for this – just a disconnect between my own made-up expectations and the truth. All that criticism aside (don’t be discouraged), An Uncommon Education was a tremendously accessible read and gorgeously written. I particularly loved Percer’s thematic quest through the search for identity from childhood, through college, and into adulthood. How many times we reinvent ourselves during these formative years and how far off the mark we often end up from our earliest aspirations is well-conceived in Naomi’s story. At many times, I found myself in Naomi and know that many other readers and bookish women will find themselves too. The things I didn’t like about the novel only stem from the fact that I wanted everything to be perfect because this story was something I clung to from the very first page. Having read many similar tales of all-female prep schools and colleges, An Uncommon Education was hands-down my absolute favorite – far and above any similar plot-line I’ve ever read. Definitely worth a read! But don’t just take my word for it! Percer’s debut was named one of Amazon’s Top 10 books in May and many others on TLC’s book tour have wonderful things to say as well. Thanks so much to Harper and TLC Book Tours for the generous copy of An Uncommon Education in return for my honest review! Check out the rest of the tour at TLC Book Tours.